On Wednesday, September 17, the U.S. Embassy’s Consular Section held a reception at Liberty Overlook in appreciation of its key partners who support safe travel and provide services to assist American citizens in The Bahamas. The event served as an opportunity to recognize some of the Embassy’s most critical and helpful contacts. U.S Chargé d’Affaires a.i. Lisa Johnson and Consular Chief Nathan Hara were on hand for the event joined by Brazilian Ambassador His Excellency Carlos Costa, Ministry of Tourism Permanent Secretary Harrison Thompson, Ministry of National Security Permanent Secretary Carl Smith, members of the diplomatic and honorary consular corps, other senior U.S. and Bahamian officials and private sector representatives. Chargé Johnson gave remarks expressing gratitude for the hard work and collaboration between the U.S. Embassy and its key partners in assisting American citizens and facilitating visa services. During the event, the U.S. Embassy formally recognized two individuals who provided exceptional service over the last year. Dr. Christina Thompson was honored for her courtesies extended to immigrant visa applicants who visit her clinic for required medical exams and Mr. Kendal Rahming was recognized for his excellent service provided to detained U.S. citizens in his role as Deportation Officer at The Bahamas Department of Immigration. 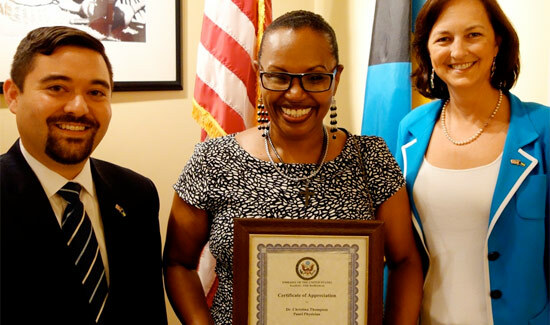 With over five million U.S. visitors to The Bahamas each year and visa applicants from over 100 different countries, the U.S. Embassy’s Consular Affairs Section dedicates significant resources to providing high level consular services that promote the safety and welfare of American citizens and facilitate the legitimate travel of foreign nationals to the United States. Caption: From left: U.S. Embassy Consular Chief Mr. Nathan Hara, Dr. Christina Thompson and U.S. Chargé d’Affaires a.i. Lisa Johnson.